I'm just learning how to work with GIMP. I've downloaded the latest version. Can anyone tell me where to find the desaturation tool pls? In the course I'm following they work with version 2.8.4 from 2013. >I'm just learning how to work with GIMP. >I've downloaded the latest version. >Can anyone tell me where to find the desaturation tool pls? >In the course I'm following they work with version 2.8.4 from 2013. 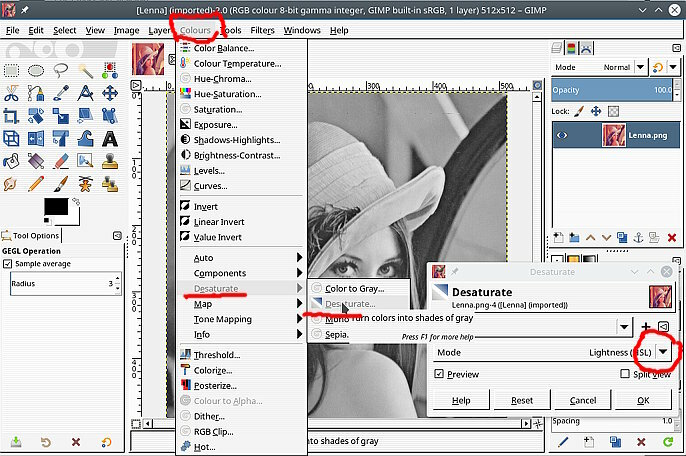 Colors -> Desaturate -> Desaturate -> then select a Mode.